TIP: Some of this theory is worked out on our page on our “Separation of Powers Metaphor” and it is related to “The Spheres of Human Understanding“. See those pages as well. At some point i’ll attempt to combine all this, for now, the theory spans several pages. These classical elements are related to a few other basic concepts including one that represents the most fundamental duality Yin and Yang (or Female and Male), where Female (Yin) is the passive and receptive (including Water and Earth), and Male (Yang) is will-or-reason-in-action (including Air and Fire). Power (Fire): The Natural law. Burke, Hobbes, Machiavelli. Force-in-action holds together the social structure, be it a strong leader of a Republic, a despot, an army, or a benevolent prince. See Realism. Economy (Earth): The Civil law. Marx, Engles, and Smith. The idea that economy (capital, labor, means of production) forms the social structure. See Empiricism. Reason and Ethics (Air): The Ethical law. Aristotle, Hume, and Rousseau. The idea that law and reason can be used to understand the natural laws and then can be used to organize society around a social structure that adheres to the other elemental forces. See Rationalism. Spirituality and Morality (Water): The Eternal law. Aquinas and Filmer. The idea that the enteral law forms the social structure, and that a King plays the role of Hierophant (bridge between God and the people, which creates the divine law). See Idealism. As you can see, the benefit of using this time-honored system is one of easy analysis and codification. It is important for the same reason a Myers-Briggs test is; it helps us understand ourselves and our collectives. Now, if we extrapolate this concept and consider a few other classical theories, namely the symbolism of Greek mythology and the Kabbalah, we get the basics of Tarot and Western Astrology. It is from this lens that ALL the Tarot and Astrology can be understood as a metaphor for the human condition, and by which we can add necessarily complexity to theories we examine using this method. For instance: we can consider the young, middle aged, and wise King of Fire and how they are different. Astrology calls these forces Aries, Leo, and Sagittarius; and Tarot calls them Emperor, Strength, and Temperance. TIP: The chart below shows how the basic duality (Male, Female) can be defined by the elements, and then by astrological signs (which also relate back to Tarot and Kabbalah). If you know what Fire is, you roughly know what Yang and Aries, Leo, and Sagittarius are, and thus, you have an easy to understand metaphor for 1/4 of the foundation of the human condition. Greek Mythology God and Goddesses Documentary. Since the Greek Gods are used extensively as a metaphor in Western esotericism it helps to brush up on them. 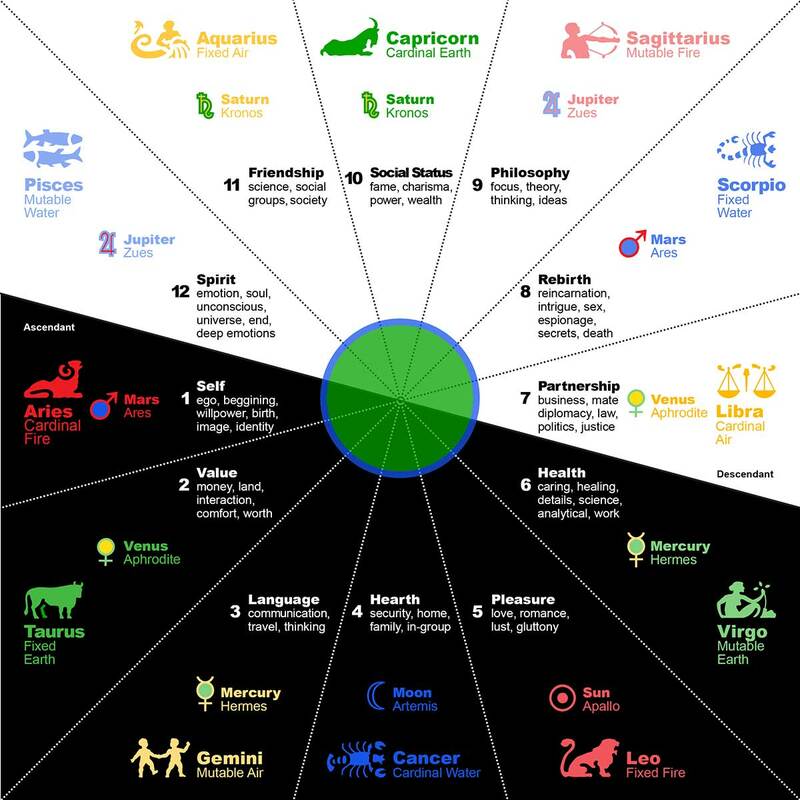 Astrology, Tarot, and Classical Element Theory are academically interesting pseudosciences that are useful when discussing concepts like Jung’s 12 archetypes and Campbell’s mythologies, which were inspired by Jung. Each was inspired by the classical elements, Kabbalah, and Greeks, as well as some eastern elements and myths that we don’t discuss here. Today Astrology and element theory are talked about like they were invented by the Sunday paper and are translatable only by mystics, but this isn’t true. They are simply, like mythology, symbols that can be understood as a metaphor for the human condition and thus can be used for meditation and analysis. They are only magical in the way The Collected Works of C. G. Jung or perhaps the way Joyce’s Finnegans Wake is. This is to say they can be insightful and spiritual, but never magical as magic isn’t a real thing, but spirituality, metaphors, psychology, and myth are. The merit of studying the old pseudosciences will become clearer as we examine their symbolism. TIP: This page also doesn’t discuss Alchemy, which is an early form of chemistry that uses the language of the classical elements. This metaphor doesn’t translate well to an actual chemistry, but it does relate just fine to the classical forms: solid, liquid, gas, plasma. Thus, these forms are the ones we would equate to for a modern metaphor. Below is a list of each key symbol and an explanation. Consider reviewing our page on the basics of Tarot and Western Astrology before moving on. The Male and Female. All energy is either Yin (female, black) or Yang (male, white), this includes the energy of each element where Fire and Air are male, and Water and Earth are female. This is the fundamental duality that describes all dualities including the first abstractions. It is only superseded by the singularity, which can be roughly be thought of as (in Eastern terms) The Tao (the Tao that can be named is not the true Tao) or in western science the big bang or big bounce (the state in which the standard model particles were unified). The idea is that as soon as you have a concept you have an abstraction, ugly creates beautify, dark creates light, etc. The Male and Female symbolically represent all dualities that arise. In western society today we might find the symbolism of male and female sexist, but that sensitivity is not useful in understanding this philosophical construct; as in the concept of yin and yang, male and female are equal, opposite, and oscillating. They are the ultimate balance, and it is no more sexist to say “female” than it is to acknowledge that many biological females can carry children while biological males cannot. The Male and Female dichotomy can be seen as a metaphor for left-right politics, idealism vs. rationalism, Hume’s fork, and many other dualities. Among other things, we can understand male-female energy by looking at the Tarot Card 0 – The Fool (and also XII – The Hanged Man, and XIX – The Sun). The Tarot, tells the story of “the Fool’s Journey” or Hero’s Journey. The fool is a metaphor for the human experience; it is both the male and the female and is also called the pilgrim or the initiate. Every card in the Tarot’s Major and Minor Arcana depict the fool embracing different energies present in the human condition along life’s journey. Those energies are best understood by understanding the dualities and elements. Wands, swords, cups, and coins of the Tarot are the elements, and each has a duality. It is by these elements and dualities that the meanings of the cards are known. Male is the will-or-reason-in-action, it describes outward energy. It is what we do and will to do. If we consider energy and mass, energy is the male (the one in constant motion that we can see) and mass is female (the invisible one with a sucking inward motion which is heavy). It is either tangible, in the case of fire (where one can “feel the burn”), or intangible in the case of air (as until there is will-in-action there is only thought, which is not a physical object). It is Rational and clever. I – The Magician and XXI – The World. Female is the moral, empathetic, spiritual, sensual, and the physical. It describes inward motion and being. It is either tangible, in the case of earth, or intangible in the case of water. Think of it this way; it is everything that is not willpower, thought, or action. It is Empirical and wise. II – The High Priestess and XIV – Temperance. Fire is the will and action and is symbolized by the wand or scepter. In social contract theory the will-of-the-people-in-action is symbolized by the king’s scepter (it is the executive). Imagine a magic wand that shoots fire at light speed, or “carrying a big stick” or club, this manifestation in fire of pure energy and aggression is the outward male energy. We can relate fire to gods like Apollo and Ares. IV – The Emperor or XVI – The Tower. TIP: Lady justice holds a sword which represents reason. Lady Liberty holds a flame, which is like the guiding light of IX – The Hermit or like the illumination of the lighthouse which guides a ship. See VIII – Strength, where reason tempers will. TIP: Lady justice’s scales are equatable to the symbol of a cup (although the cup is better symbolized by the V – The Hierophant or its use in XIV – Temperance XVII – The Star). There is an aspect of justice that is wise. Some complain that modern western society has forgotten some of its spiritual aspects, by our metaphor that is, of course, a recipe for disaster. We have freedom from and of religion, but it is not within human nature to be free from spirit and emotion. The twelve signs of the zodiac are divided into the four elements and three types of energy: Beginning, Sustaining, and Ending. The following list is ordered as such. Fire signs are Aries, Leo, and Sagittarius, Earth signs are Taurus, Virgo and Capricorn, Air signs are Gemini, Libra and Aquarius, and Water signs are Cancer, Scorpio, and Pisces. So using Fire as an example, Aries is beginning fire energy, this is like a baby or a barbarian who sacks villages with club and torch in hand. It is will-in-action, the young will, young outward male energy. It is starting Fire and it is symbolized by the Greek God Ares, the god of war and its planet is Mars and the Sun. Likewise, we can equate it to Apollo the sun god and to the Roman god of war Mars and so it will go for each element. Similarly, middle or sustaining fire is symbolized by Leo and could be symbolized by a stage actor burning with charisma. In the Tarot the female energy tames the pure male fire energy of Leo, and in this, like the actor on the stage, the fire can sustain and not burn out. This is why the Tarot card VIII (the one with Leo on it) is called Strength (Rider-Waite) or Lust (Thoth). Meanwhile, ending fire is symbolized by Sagittarius, the quick moving bow-wielding centaur Chiron, who mentored Achilles in archery (Achilles was a Greek hero of the Trojan War and the greatest warrior of Homer’s Iliad; thus Achilles is “the Fool”). TIP: The other elements work just like this, you can look it up using the links below or using Google. Learning the whole system is akin to mastering element theory, mythology, astrology, tarot, and Kabbalah (and that is just Western mysticism! An introduction will have to suffice). Putting together all the above, the “Fools Journey” is the story the Major Arcana Tarot cards tell when understood one at a time. Each card is related to an astrological sign and element and thus the fools journey is, at its core, understood using the classical elements. Here again, we get a clearly laid out metaphor for the human condition. Astrology is also a metaphor for the human condition, and it tells the same story as the Tarot (see why astrology seems to work; its that and cold reading). Each card also relates back to the Kabbalah. One last concept that is key to astrology is that the astrological wheel also relates to four types of association: self, interpersonal, collective, and universal. This part is an important part of the metaphor because it explains our interaction with others. Eastern Hemisphere (Houses 1, 2, 3, 10, 11, and 12): Inward Social. Western Hemisphere (Houses 4, 5, 6, 7, 8, and 9): Outward Social. Northern Hemisphere (Houses 7 – 12): Inward self. Southern Hemisphere (Houses 1 – 6): Outward self. NOTE: Yes, the southern hemisphere is on the top of the chart and north is on the bottom. TIP: In the chart below, the house ordering starts with Aries. So Aries is the first, then we move counterclockwise and thus Taurus is the Second House, Gemini the Third, etc. So you can use that to divide the above houses. This astrological wheel shows the basics of signs, houses, elements. (source). Now that I have introduced you to the above concepts, you can use this guidepost to learn about the elements and their older brothers mythology, astrology, and tarot. By meditating and studying the symbols, you’ll be able to use them for metaphors for better understanding the human condition. Tarot Cards of the Zodiac – A list of which Major Arcana Tarot Card goes with which Astrology Sign. Tarot and the Kabbalah – A list of how the elements and Tarot and astrology and Kabbalah relate. « What is the General Will?